This is an open letter to all those people who have annoyed me over the years, ignoring campground rules, common courtesy, and generally ignoring the unwritten rules of polite human behavior. Too bad none of them will actually read this. To the guy at the top of the Vernal Falls trail in Yosemite: was it really necessary to light up a cigarette as you blocked the trail, then toss it into the river when you were finished? I'm impressed you made it up there considering your tobacco addiction, but why must you litter? Why? To the family who enjoyed a large spaghetti dinner in Sugar Pine Point State Park in Tahoe, then threw all the leftovers into the dumpster next to our camp and failed to close the lid (ignoring multiple warning signs about bear activity in the area). Were you trying to lure the bears in, or are you just illiterate? Just so you know, we chased the female bear and her cubs away at two in the morning, in the hopes of saving them from extermination for the bad habits you were encouraging. To the older gentleman outside Lake Havasu who politely asked us if it was ok to run his generator for a few minutes to charge up his battery: when you said a few minutes we didn't realize you meant all night. I hope you got a good night's sleep because we laid awake and cursed your existence after trying unsuccessfully to knock on your door to ask you to turn it off. Maybe you just didn't hear us because your generator was so loud. To the French-Canadian at the very crowded Many Glacier campground in Glacier National Park who, after passing up the campsite we decided to occupy, circled back and claimed he had already chosen it, but just hadn't paid for it yet: just so you know, we let you have it rather than make a scene in such a beautiful place. And we found a better one. To the young men who set up camp next to us in the redwoods, opened the doors of their truck and started blasting heavy metal music: listening to your choice of music is generally not why we go camping. Especially when it makes our ears bleed. 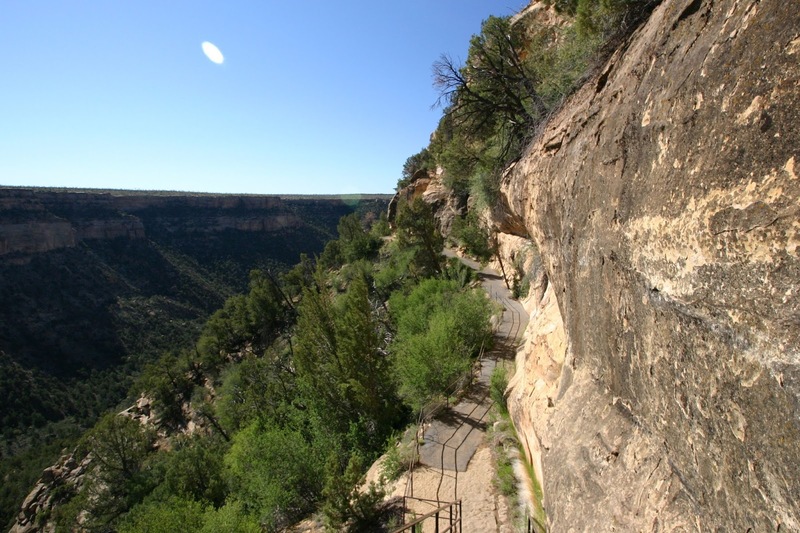 To the boys that threw rocks off the overlook in Mesa Verde, narrowly missing us on the trail below: I'm sorry your parents wouldn't let you bring your Game Boys, but couldn't you find something else to occupy yourselves? To the couple in the Plumas-Eureka campground who chose the site two spaces away, even though we were the only two vehicles in the entire park and there were fifty other spots to chose from: thanks for plugging in your generator and letting it run all day, then frowning at us the two times our dog barked. Apparently her noise was bothering you and I'm deeply (not at all) sorry. To the woman who thought it was a great idea to bring her trumpet camping, playing it well into the night: Wow. Just wow. To the family that pulled into camp past midnight and loudly unloaded their cars, shouting back and forth to each other as they set up camp, and even feeling it necessary to set the car alarm each and every time they left it to bring a load to the tent (Beep Beep! Beep Boop! ): you guys are special. And great touch letting your little boy pee on the wall of your neighbor's unit. To the mother-son duo who were occupying the unit behind ours that stayed up until 2:00am getting drunk and arguing loudly, even after repeated warnings from camp security to quiet down: no one cared who said what to who. In fact, we were all rooting for you to strangle each other just so we could get some rest. 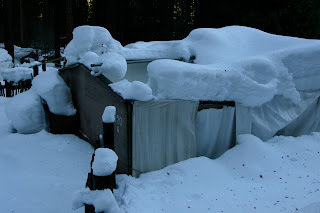 February at Yosemite's Housekeeping Camp: the only time of year it's quiet. And to the hundreds, if not thousands of decent, wonderful people we have shared camp with over the years; those who were friendly, who picked up trash even when it wasn't theirs and waved hello to be neighborly; to the guy who offered to help us change a tire on a brutally hot Death Valley backroad; to the couple that were taking off on a long backpacking trip and left us their extra food; to the older gentleman that brought firewood over when he saw we didn't have any; to the many campground hosts that made it their priority to make sure we had a good stay; to all the people that make camping a joy, I thank you from the bottom of my heart. 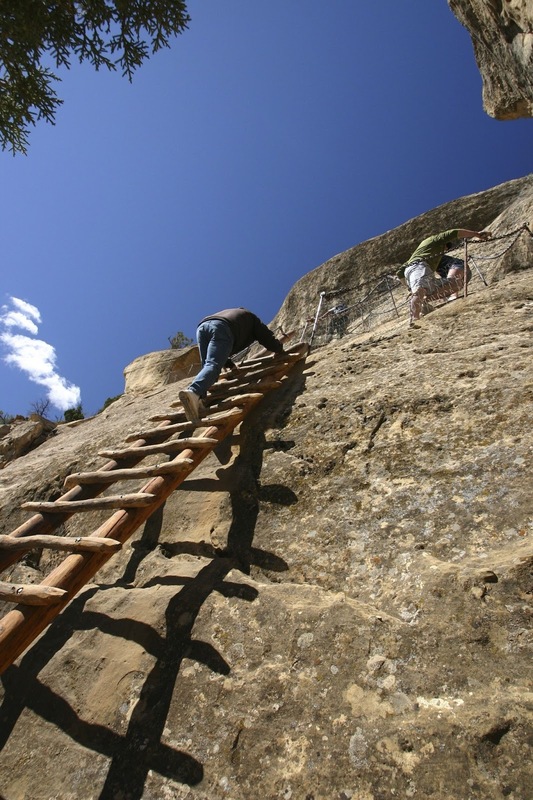 You are the icing on the outdoor cake, what makes a great experience excellent. People like you far outnumber the clueless, ignorant nincompoops and for that I am sincerely grateful. Are we the only ones that are so lucky? Tell me about your worst experience with a fellow camper or hiker in an email (runningfrommoose@gmail.com) and I'll include it in a future post--credited to you of course! 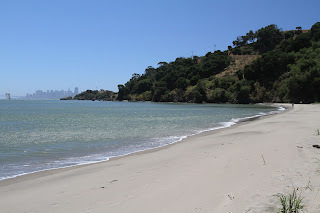 We decided to make a run out to Angel Island in San Francisco bay last Saturday. We hadn't been there in over twenty years, which is ridiculous, since it's only about an hour from our front door. When I was a kid my family used to sail over and anchor in Ayala Cove once in a while but since losing boat privileges, it's not quite as convenient. 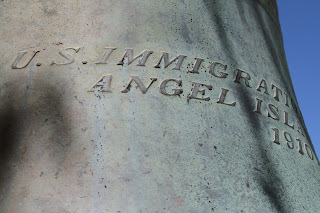 Angel Island has been used by the military since the Civil War; before that it was used as a cattle ranch; before that as a base for Spanish explorer Juan Manuel de Ayala who, in turn, took it away from the Coastal Miwok Indians (isn't that the start of every historical account of North America?) 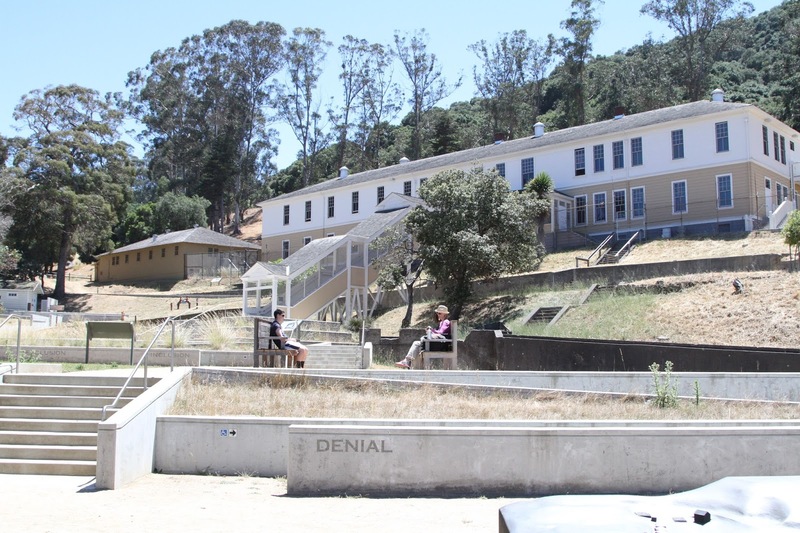 In 1962 the missiles were hauled away and it was turned into a state park, with the exception of a sliver of land that is still a Coast Guard station. 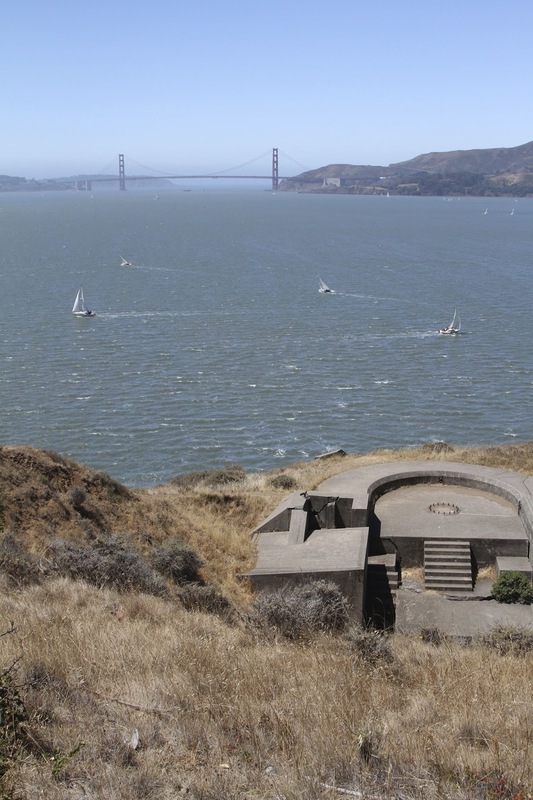 The island has quite a few remnants of all the various military activities, from a fort with cannon placements to Nike Missile launch pads. 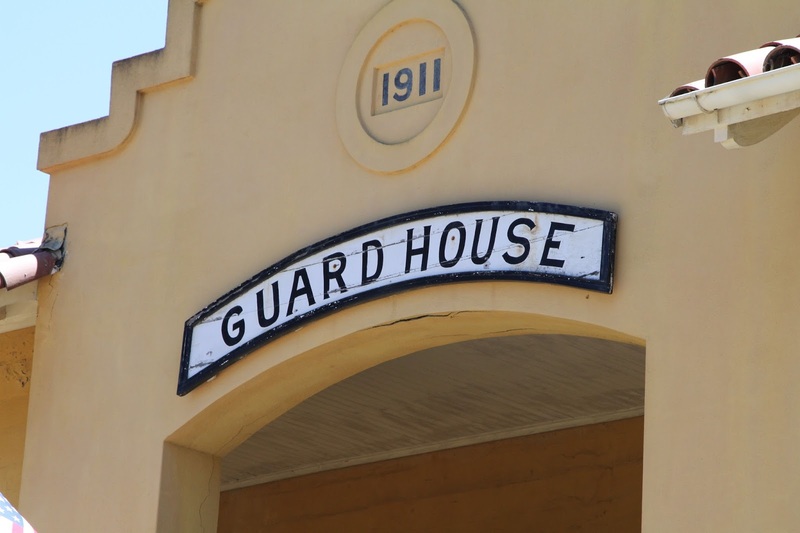 The most extensive buildings are from the two World Wars and from when it was used as an immigration quarantine station. 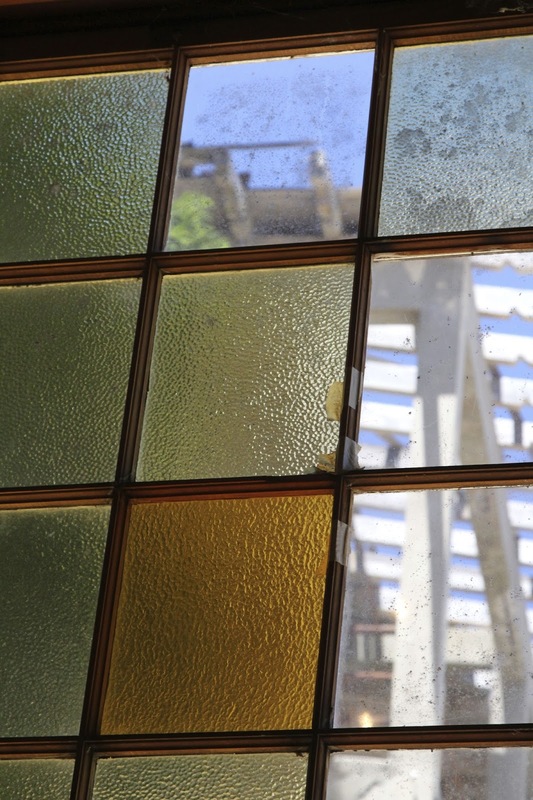 In the last few years, some of the buildings have been refurbished and opened as museums to further explain the history of the sites. I just love this stuff. Mark and I got off the boat in Ayala Cove and checked out the small Visitor's Center. Things have really gotten fancy since the last time I was there, some of the buildings have been fixed up and there are now bike rentals and a little cafe open to the public. We had planned to stay for the day and had packed a lunch and water so we would be prepared to make the full 5 mile loop of the island. 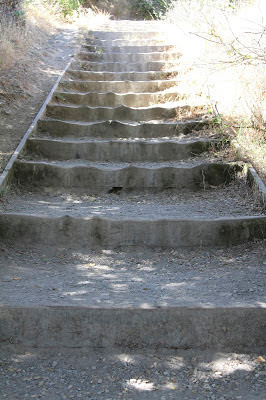 The stairs leading up from the cove to the Perimeter Rd, well worn by many feet. 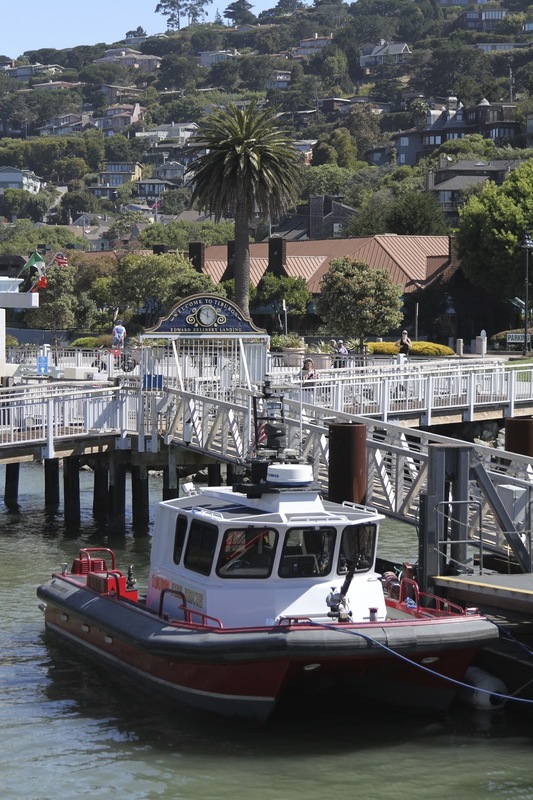 It's one of the only places you can go that affords a 360 degree view of San Francisco Bay. 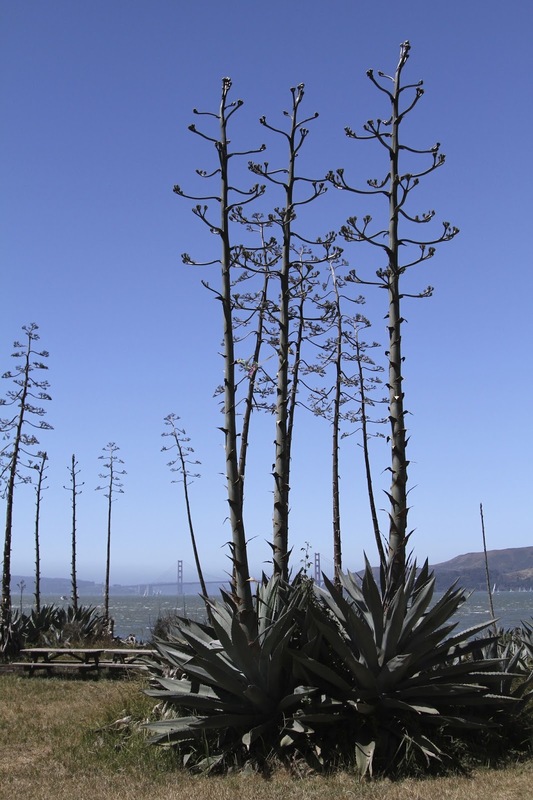 As you walk around the Perimeter Road you can see Tiburon, Sausalito and the Marin Headlands, the Golden Gate Bridge, San Francisco skyline, the Bay Bridge, Oakland, parts of the Alameda shipyards and of course, the water surrounding everything. 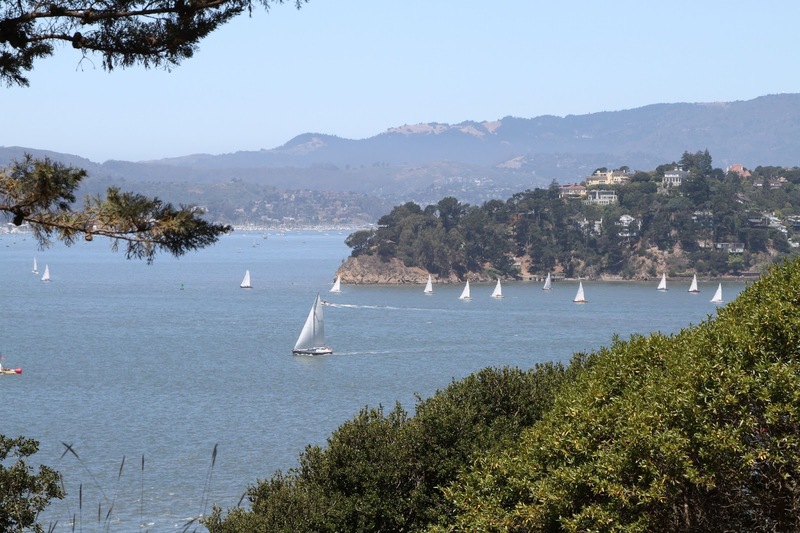 It was a gorgeous day, a little windy, but that brought out a slew of sailboats which made for some great pictures. Looking towards Marin County, Tiburon in the foreground. Looking out from Camp Reynolds. Our first stop was Camp Reynolds, an old Civil War base that was made into a training camp during WWI. 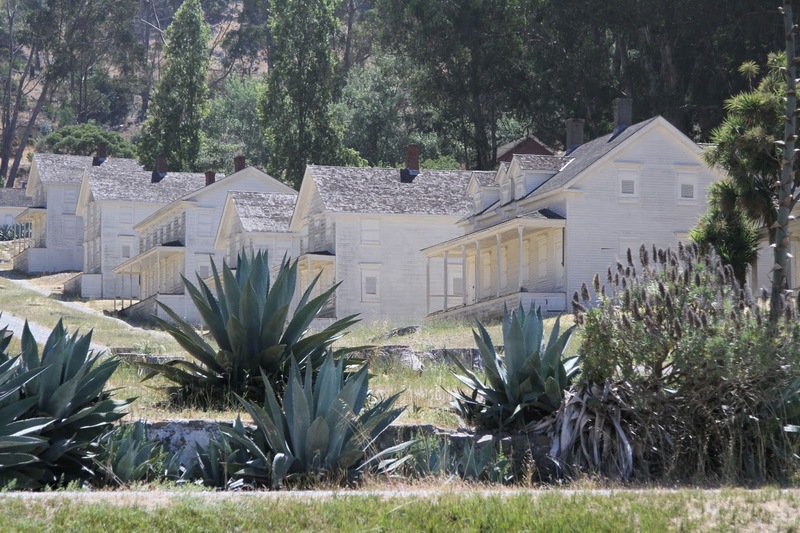 They've restored many of the buildings there and you can almost feel the history of the place as you walk through the grounds. 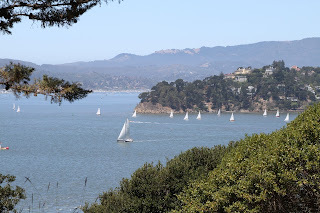 We watched as some kayakers took off from the little beach nearby, and a regatta of sailboats were skimming the water there as well. We continued down the road and found some old gun placements, only the concrete bunkers left to tell the story. We climbed down and explored the bunkers underneath, which were impressively sturdy after all this time. 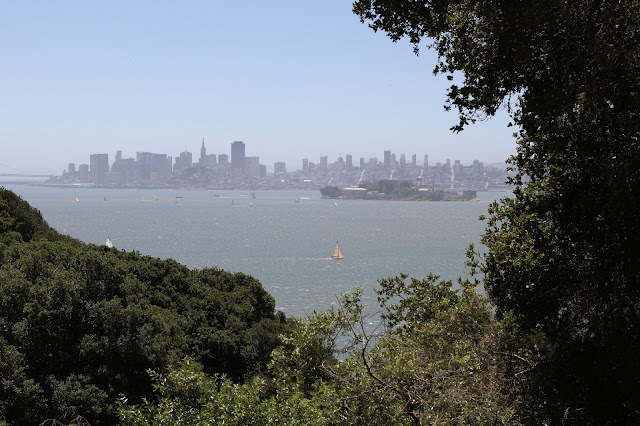 From there we passed an old quarry, with some of the mining equipment still in place, and had lunch on a bench overlooking the bay and San Francisco skyline. With as many people sharing the ferry with us on the way over, the island was surprisingly uncrowded. We met few people on the road, and even fewer on the side trails. There were many benches scattered around at the various viewpoints and we always found a seat when we wanted one. Lunchtime view: San Francisco skyline with Alcatraz in the foreground. Our next stop after passing the former Nike Missile placements was the East Garrison, or Fort McDowell. This was the stuff of nightmares for me when, after exploring the ruins at dusk on one of my family's boat trips here, I went to sleep that night and dreamed the hospital was full of patients that had been left behind, all reaching for me as I walked by, calling for help. It took years for that one to wear off. Coincidentally it was also the scene of Mark's first (and hopefully last) crime: breaking and entering. 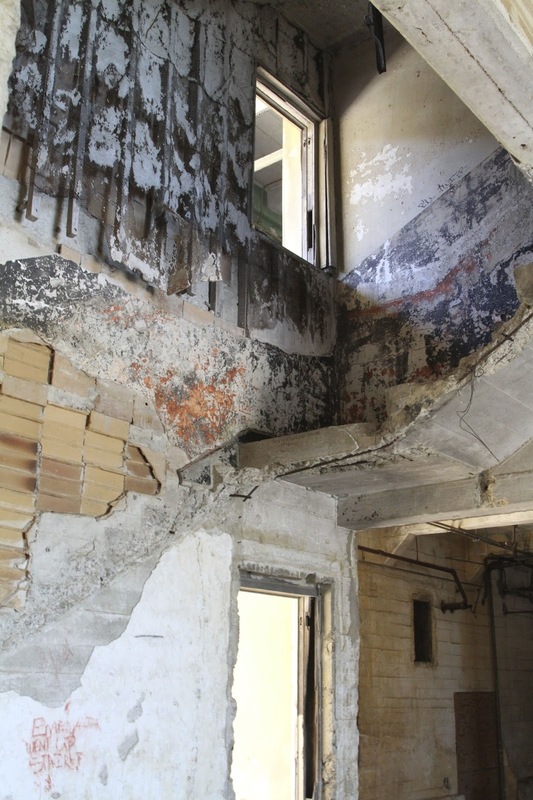 As a twelve year old on a church field trip, he and a friend decided to explore the old buildings. 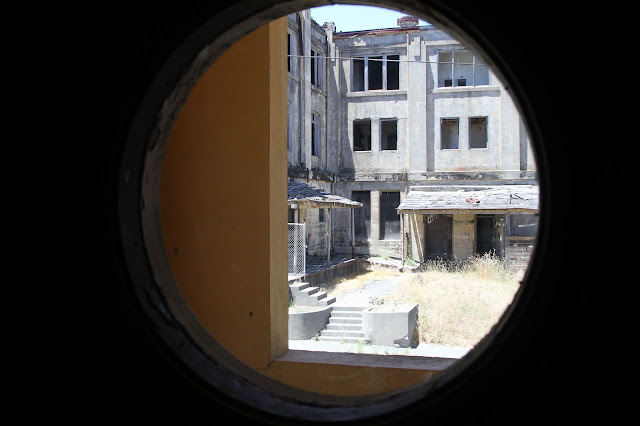 After climbing a drain pipe and running through the top floors of the hospital, they started trying all the doors of the old houses, finding one open and going inside. Just as they were leaving the house, a ranger finally caught up with them and threatened to throw them off the island. 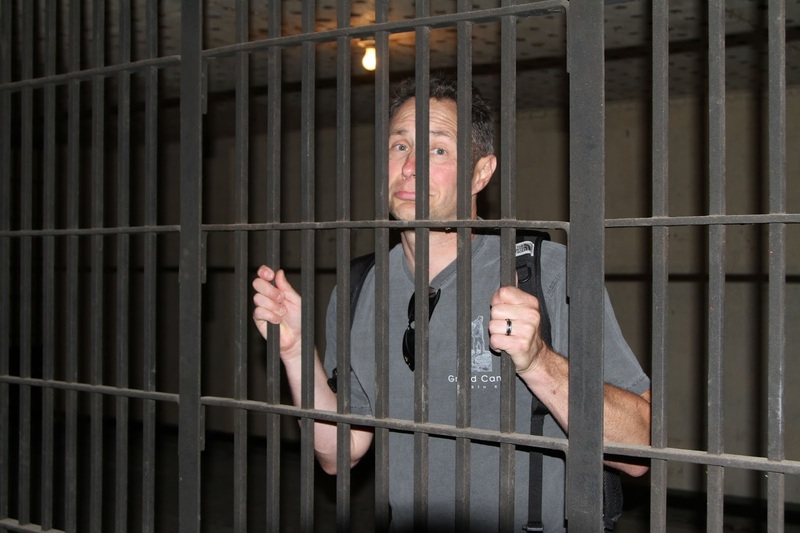 It was appropriate that they have recently refurbished the Garrison, complete with holding tank and jail cells underneath, formerly used for misbehaving soldiers. 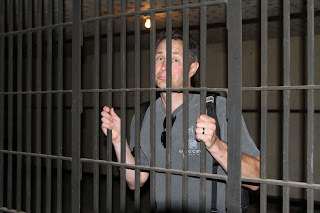 Mark put himself in the pokey for some slightly delayed justice. of the hospital to discourage Mark-like behavior. 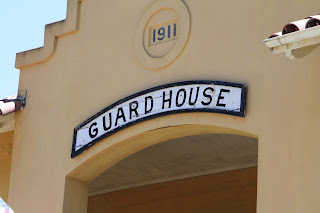 The recently renovated guardhouse at East Garrison. Justice at last! The trespasser in lockup. After bailing Mark out, we looped around to the Immigration Station. This was the Ellis Island of the west coast, the first stop for immigrants from 1910 to 1940, and unfortunately, a long stay for some of the Chinese immigrants due to discrimination of the times. There is now a museum in the main dormitory building, and they are working on opening one of the other buildings for visitors to view. 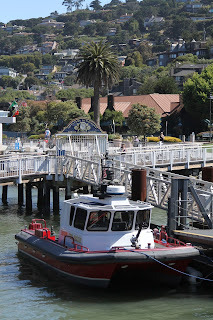 We walked back to Ayala Cove from there and caught the ferry back to Tiburon. Notes for next time: bring a bigger hat and more sunscreen--we were fried after a full day in the sun. We had a fantastic time though, and kept asking ourselves on the way home: Why don't we do that more often? 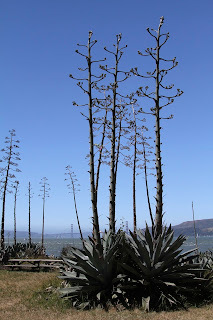 A new life by the Golden Gate." Many thanks to the enthusiastic living history docents that showed us around East Garrison, and the Park Rangers that made sure all the visitors got on the proper boats on the way home. I relied on two websites for the history information in this post: Angel Island Conservancy and Americans All for the monument translation. After leaving Mesa Verde around noon, we drove east towards Durango. We thought we'd stop for lunch there since we had read about the really cool downtown area with old Victorian era houses and such. 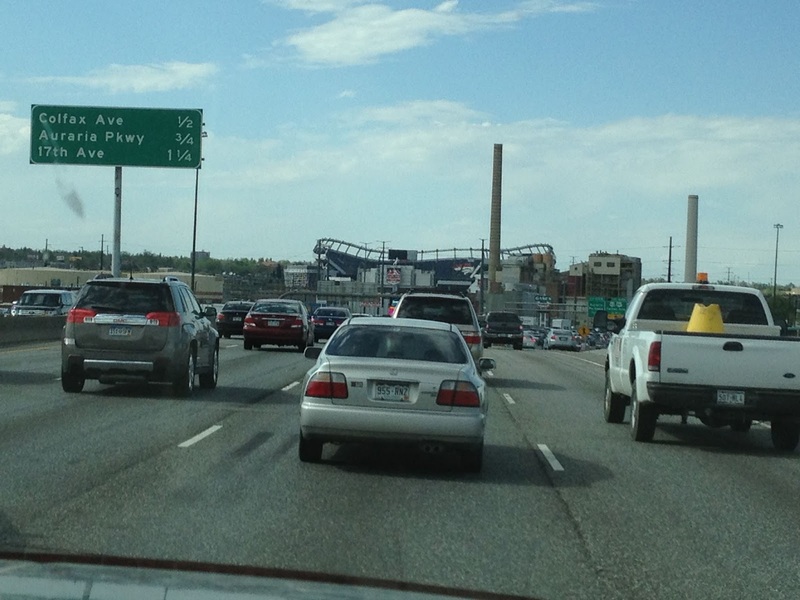 Didn't really do our homework though, as it seems the highways in Colorado are all built to circumvent the towns. We kept expecting to see Durango at any moment, finally looking at the GPS and realizing we had already passed it. The only thing visible from the highway were a few fast food restaurants, the very things we were trying to avoid. 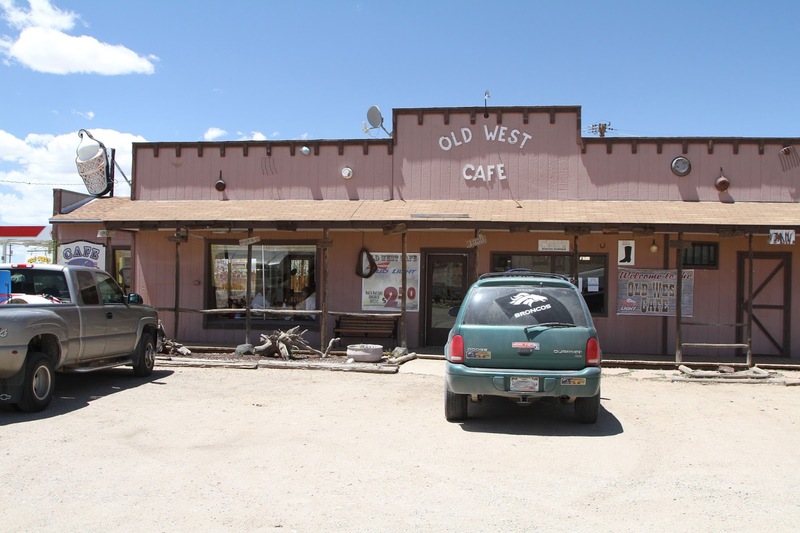 We like to stop at local diners when we travel--it really gives you a better feel for the area and you get to talk to the locals. Since we were on a pretty strict timeline we didn't want to backtrack, so we kept driving hoping to run into something along the way. 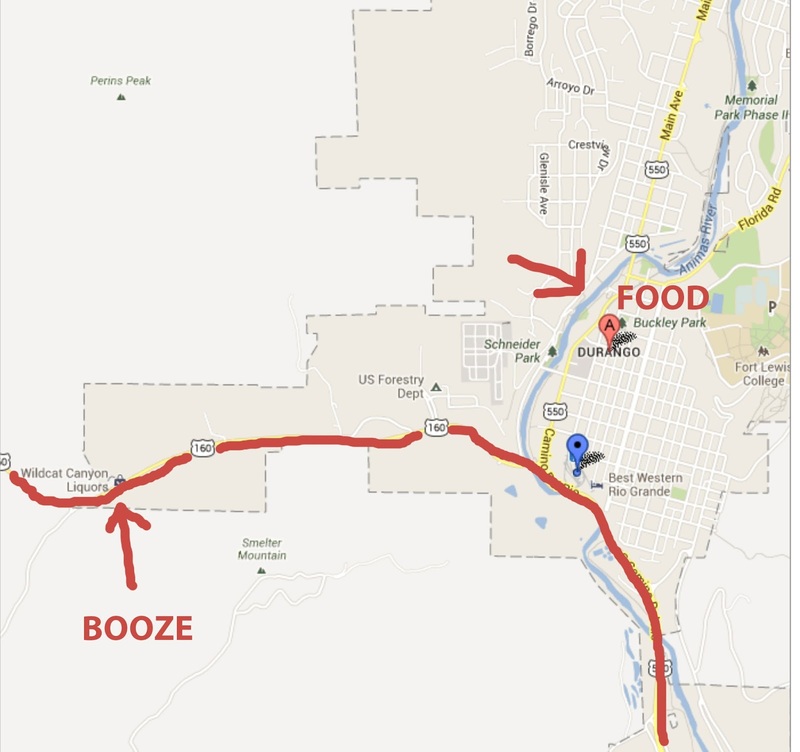 Notice how Highway 160 skirts downtown Durango (and the cafes within) yet, thoughtfully, Wildcat Canyon Liquors is located right on the road. I looked ahead on Google maps and found the small town of Bayfield had a little diner that sounded perfect. This time I mapped the way, determined not to miss the exit, since this town also seemed to be located off the highway. 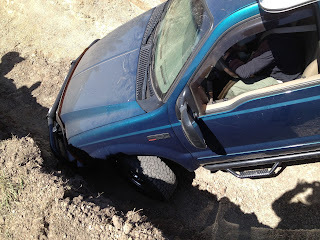 We dutifully followed the "smart"phone's directions, turning off at the prescribed road, immediately hitting a detour. OK, we thought, this will go around the road work and circle back to the town. Nope. 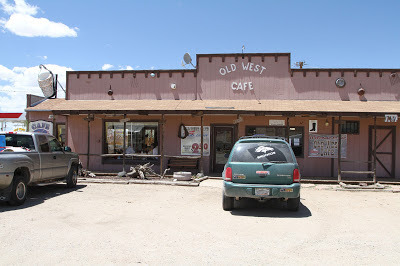 We kept driving through a little housing area, passed some small farms, through some larger ranches, onto a dirt road, finally hitting another highway and a completely different town. What the hell? Did we miss a turnoff? No, apparently Bayfield did not want to be found. We ended up backtracking after all to get back to Highway 160, wasting half an hour and STILL no food. By the time we got back on track we were so grumpy and disgusted we stopped at the first gas station we could find and I made some PBJs in the camper while Mark filled the tank. Take that, Bayfield! If we had only known that Pagosa Springs was just ahead. What a cool town it was, and the highway went right up the main drag, just as a small highway should. According to the guide book, Pagosa Springs has some natural hot springs that come up from beneath the mountains and are supposed to be healing. There are a couple of nice resorts, one of which has the mineral water piped right into the rooms. Ahhhh, to have the time and money to stay...We wiped at the jelly on our mouths as we passed several perfect little restaurants that would have served a lovely meal. Oh well, at least we saved some cash. It was late afternoon by the time we arrived at the entrance to Great Sand Dunes where we were greeted by a large handwritten sign that read: Campground Full. It was beautiful though. The sun was setting over the dunes, and the mountains and sand were glowing in the warm light. 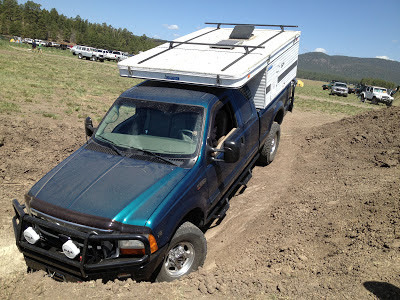 We drove through the very full campground on the off chance there was an opening. It was a nice place, there was even a little camp store that sold firewood and a few supplies. But the sign didn't lie; it was full. We drove back down the road to a private campground we had passed on the way in, the "Great Sand Dunes Oasis" billed (on their sign) as the "Gateway to Recreation". What could possibly go wrong? The office was closed, and the sign at the gate said not to enter unless you've checked in with the office. We decided to go on in, since our only alternative was over an hour's drive away and the sun was already starting to set. There was a sign further up the entrance road that said to check in with the office in the morning if arriving after hours. Well why didn't you say that on the first sign? It turned out to be pretty nice, actually nicer than the campground in the park since this one was practically empty. There were free showers, which we were in desperate need of, and the sites were rustic, but who needs fancy? Found a nice spot with a great view of the plains below, and the sand dunes in the distance. 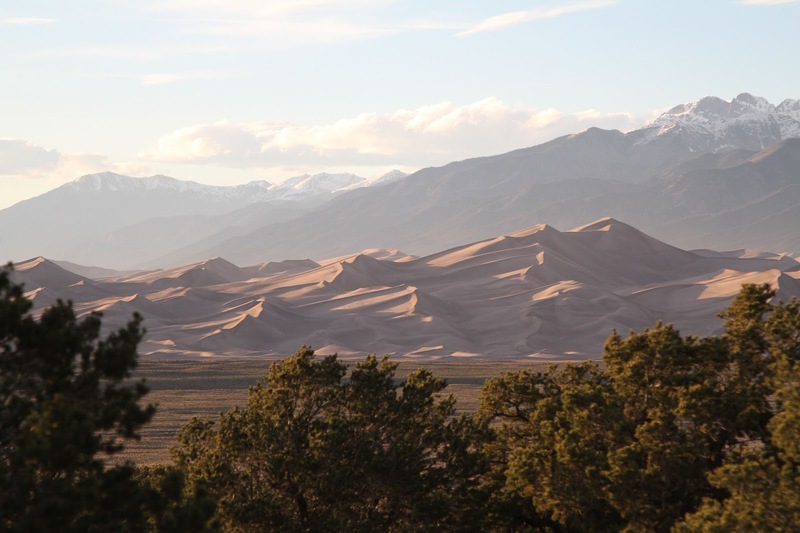 Great Sand Dunes at sunset, Sangre De Cristo Mountains in the background. After dinner we did a little exploring. We checked out the showers and laundry room in the RV section of the resort and plotted out our second shower of the trip (two a week, that's all we ask.) Walked around the loops and waved to the few other campers that were there. 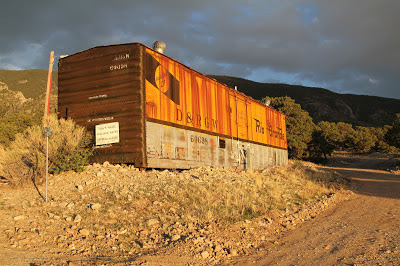 We had seen an old rail car sitting on the slope above the camp and went up to check it out. Turned out it was the restroom. How cool was that? Ladies to the left, men to the right: Great Sand Dunes Oasis restrooms. 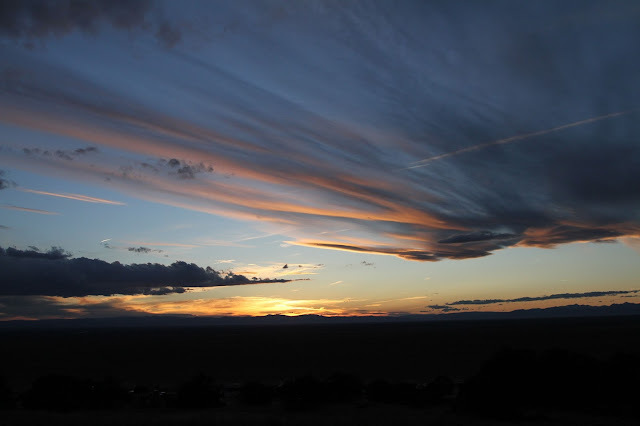 We were treated to a beautiful sunset that night. It was a nice quiet night, a much needed pleasant surprise. Got up early, took our showers, paid for the night at the office and finally, headed into the Great Sand Dunes National Park. The park itself is pretty limited. 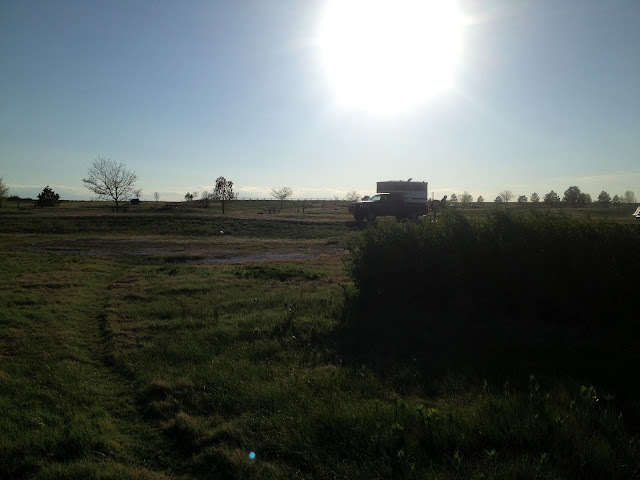 There's a huge picnic area and a visitor's center and of course the campground, but that's it. The attractions are the dunes (they actually rent sand toys at the Visitor's Center), the many hiking trails and a four wheel drive route that snakes through the park and over the mountains. Since we only had the day, we stopped in at the Visitor's Center and looked over the maps to find the most bang for our buck. 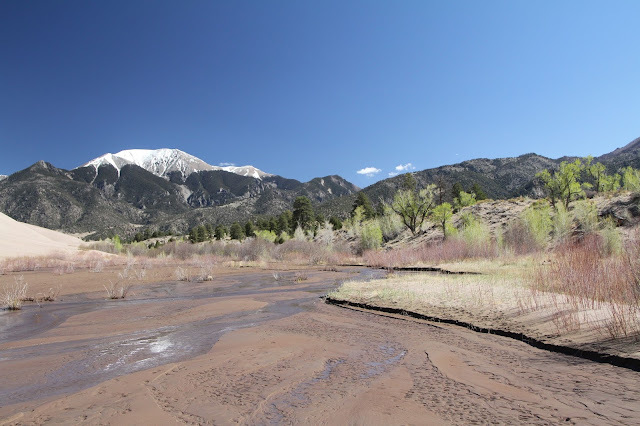 What a strange juxtaposition it was: sand dunes, the creek, and huge snowy mountains beyond that. We sat and watched the water for a while as it slowed to a trickle, then suddenly surged through. The sand was rippling and shifting, blocking the flow momentarily before the force of the water broke free. It was mesmerizing. Hiked along the creek for a while and took some pictures. 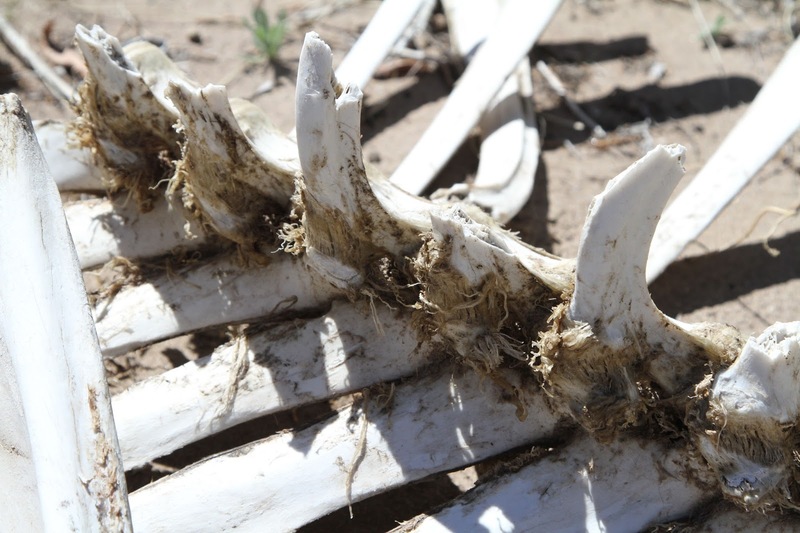 We found what was left of a large animal (cow? horse? 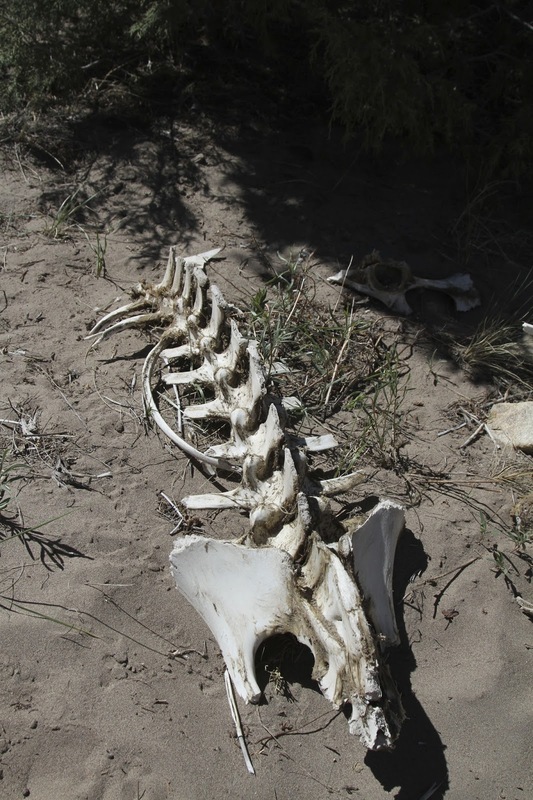 ), the bones bleached in the sun. If we had had more time we would have taken the road up and over the pass, but it was getting late in the morning and we had to get to the other side of Colorado by the end of the day, so we headed back to the main road. The park supplied an air station for the 4x4s that take the sandy road. It was great--for once we didn't have to dig out our little compressor that lives beneath a mound of hiking boots, camera equipment and other tools in our back seat. While we had been down the road, the picnic area had completely filled up with cars and school buses. It appeared there were a lot of end-of-the-year school trips going on down there, all the kids were in their bathing suits playing in the creek. It was probably the closest these land-locked kids got to a beach, with real sand to boot. So once again, wished we had more time to explore, but we were very glad we stopped. Onward to Nebraska! I wouldn't be the person I am today if it weren't for my Dad. My love for the outdoors and photography started young, and he was the one who introduced me to both. 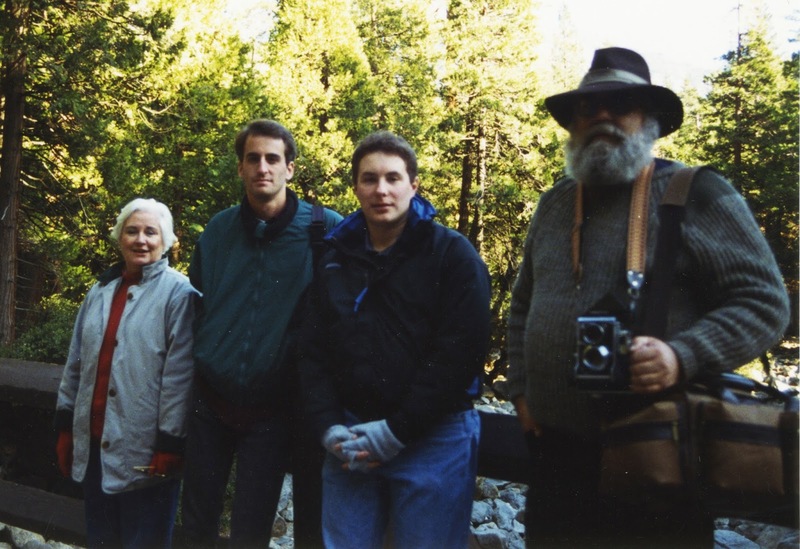 One of my first memories is hiking through the redwoods at Kruse Rhododendron State Park with the family, stopping every so often for him to set up his tripod to take pictures with his camera. He had converted an extra bedroom in our house to a darkroom, developing and enlarging photos as a hobby. When I turned 10 I got a small Brownie camera for my birthday and he helped me develop the pictures I took of the dog and my brothers in funny poses. In the early years, he'd take my older brother and I camping, I think to get us out of Mom's hair for the weekend when my little brother was a baby. 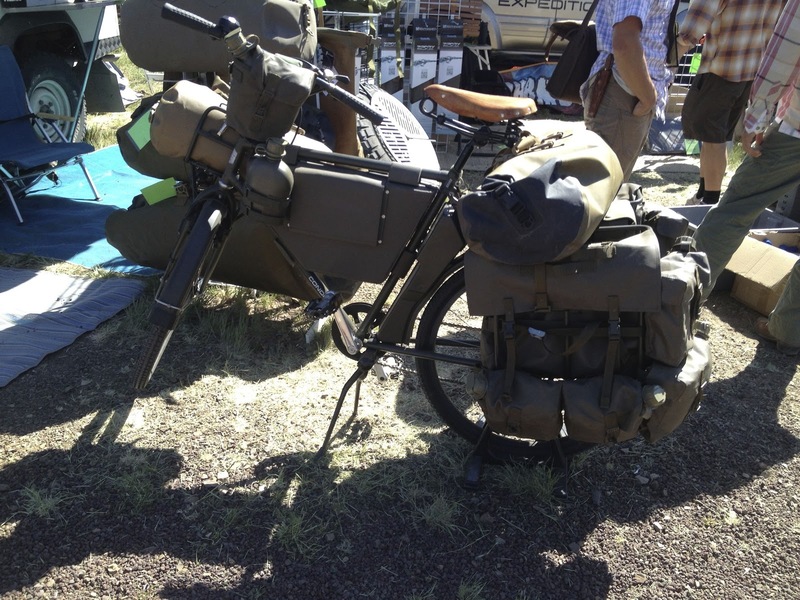 I remember waking up in the canvas Army surplus tent, that smell of mildew and damp grass mixed with campfire smoke drifting in through the flaps. He was an expert breakfast maker and we'd always have scrambled eggs mixed with linguica cooked up in a huge black cast iron pan. He had a small Honda motorcycle for a long time, and as soon as I was tall enough to reach the pegs, I would go on rides with him, usually out towards the coast. We'd stop along the way and pick up lunch and eat it at the beach. My favorite meal on one of those trips was when we shared a big hunk of cheddar cheese and some Hostess cupcakes. My mom would never have served that for lunch and it felt like we were getting away with something. A few years down the line we met some friends at a lake and they brought a little sailboat. 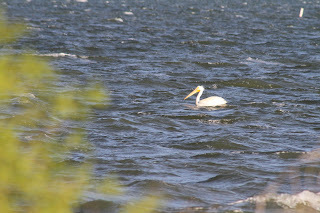 Dad and his friend took turns tacking back and forth over the lake and he was hooked. 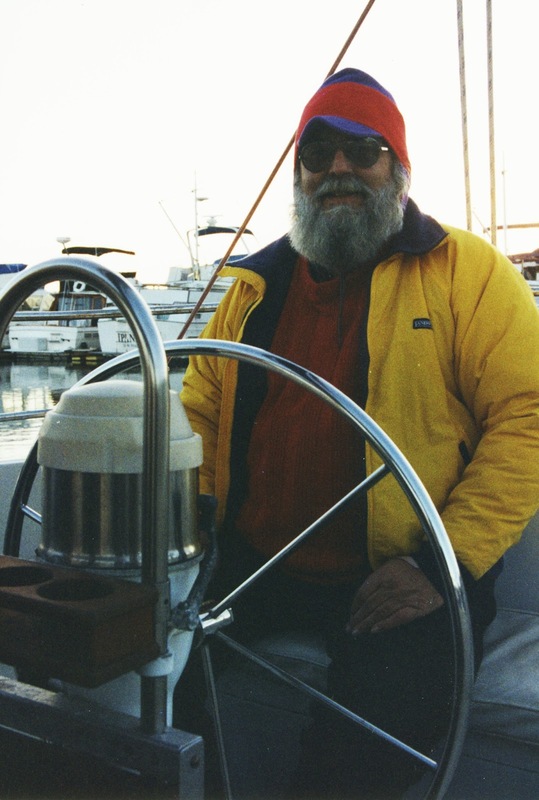 He bought a 22 foot trailerable sailboat and from then on, it was sailing on the weekends and vacations. 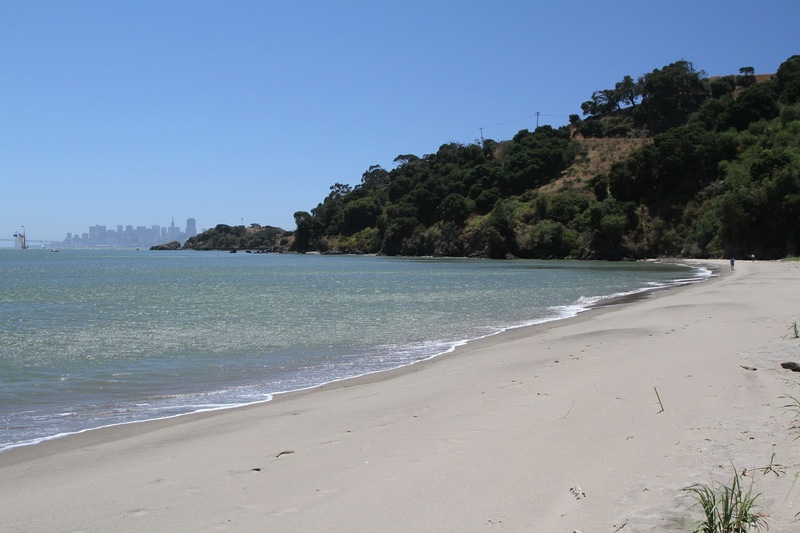 We would go to Tomales Bay on the weekends and launch it at the marina at Inverness, sailing up and down the long skinny bay. We had a little dinghy so when we stopped for lunch, he'd throw us kids in and tell us to row to shore and play on the beach for a while. Vacations were spent towing the boat to whatever destination Dad had read about during the year: Lake Shasta, Lake Berryessa, even the San Juan Islands one year. Sometimes we'd sleep on the boat but if it was an option, we'd boat-in camp, rowing all the gear to shore and setting up camp on the islands. Of course 22 feet gets pretty small with three growing kids, and anyone who has ever had a boat knows that it's necessary to trade up whenever possible; so as the years went on, the boats got bigger. 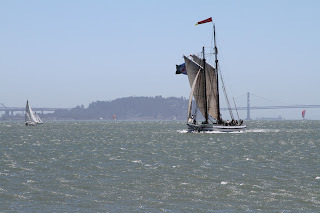 Since the larger boats weren't trailerable he'd berth them in San Francisco bay. In the summer, we'd motor up the San Joaquin River and spend three weeks baking in the sun in the Sacramento Delta, swimming and reading to pass the time. I pretended to complain, but really, there's nothing better than being able to go swimming whenever you want, hopping into the dinghy and rowing to shore for popsicles. I often think about that when I'm sweltering away in town during the summer now. 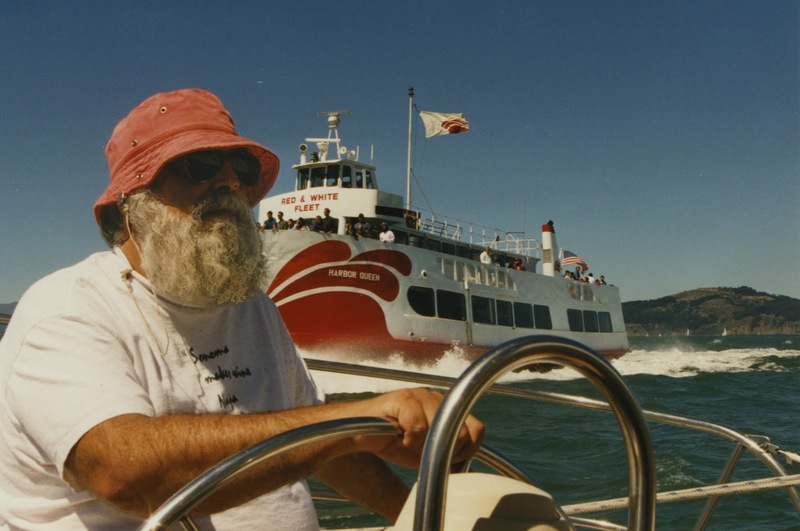 As the years went on, the boats got bigger, but his crew started to disappear. One by one we went off to college, got jobs, got married and he wasn't able to handle the boat by himself comfortably anymore. He traded down for the first time, selling his sailboat for a little cabin cruiser that didn't require raising sails and clambering around the rigging. 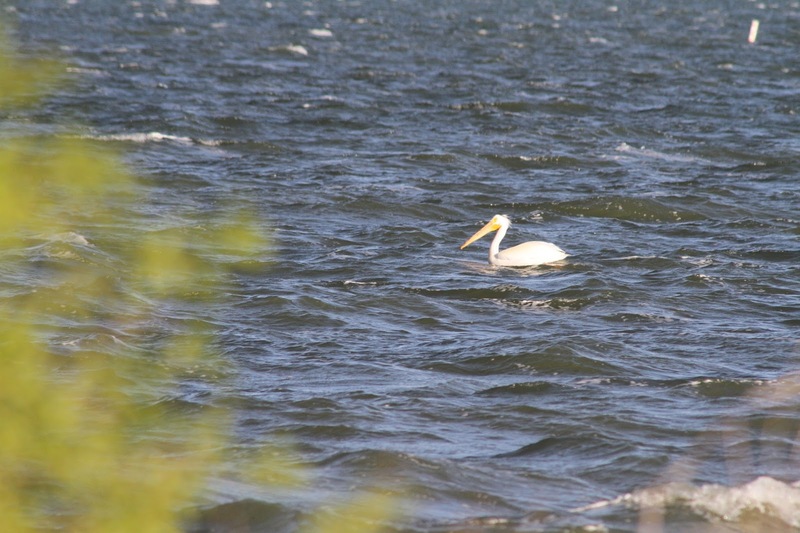 When he wasn't out on the water, he was tooling around on his cherished Moto Guzzi motorcycle. 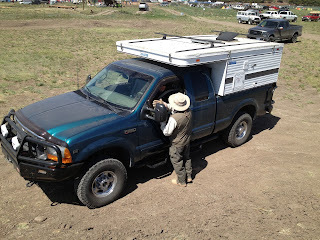 He even had a little trailer that hooked up to the back and he'd take it on road trips, meeting a group of friends he had gotten to know from the Northwest who called themselves the "Wet Leather Riding Club". He was still a camper at heart. 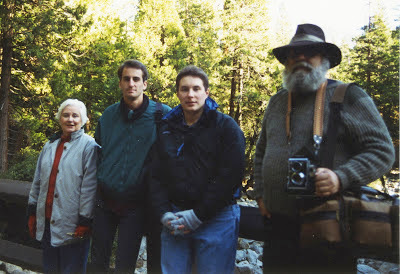 Dad and his trusty Mamiya C22 in Yosemite, with Mom, brother Kevin and Mark. When Mark and I bought our camper he and Mom were the first ones we showed it to when we brought it home. He poked his head in and said it looked like a lot of fun. We talked about camping trips we'd like to make, and asked his advice about tools we should bring, upgrades to make, etc. In 2003 we had a long-planned trip to the Tetons and Yellowstone lined up, but Dad was in the hospital with some serious health issues. Mark and I couldn't decide if we should call it off or not. I went to visit him before we were to go and told him we were going to cancel. He said we should just go, that he'd still be in the hospital, so why not just go? 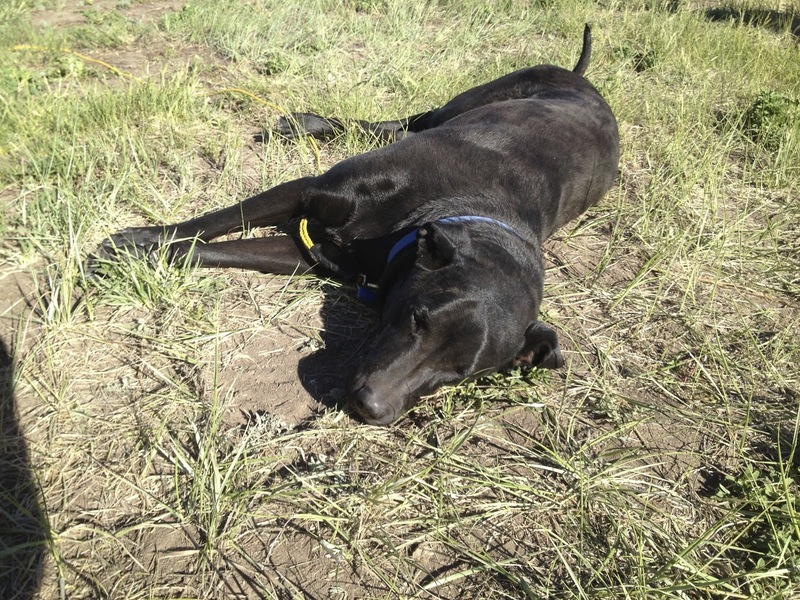 While camping in the Tetons, we got the call from Mom--come home. We left right away and drove straight to UCSF Medical Center from northern Wyoming, a fifteen hour trip, making it there by 9:00pm just in time to say goodbye. I felt pretty bad about going on that trip for a long time. But after a while I realized it's what he would have done. Why sit and worry when it won't make any difference? Why not enjoy what time you have while you can? 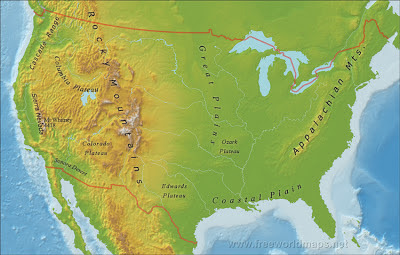 In 2004 we made a five week road trip to Alaska, a trip my Dad had always wanted to make but didn't have enough time to accomplish. We had a lot of fun, saw some amazing things, and took a lot of great pictures. I used all of the skills he taught me: driving, photography, camping, even knot tying. I know Dad would have had a great time on that trip and we made sure not to waste the opportunity to have fun, just as he taught me. So thanks Dad. I couldn't do this stuff without you. After leaving Overland Expo on Monday morning, we caravanned into Flagstaff with our friend Mel for what has become a standing tradition: breakfast at Macy's European Coffee House. Flagstaff is to Arizona as Portland is to Oregon, a funky, hip island in the midst of a retiree sea. It's got a hippy vibe that goes along with the college town atmosphere. And when in Flagstaff around breakfast time, you simply have to go to Macy's. Now, I don't drink coffee, but from the expert opinions of my fellow travelers the coffee is pretty darn tasty there. My main obsession is sticky buns, which they bake on the premises to the approximate size of your head. They also have some pretty awesome waffles that are cooked up fresh to order, with a topping of butter, syrup and fruit. Just what the doctor ordered after eating dust for four days straight. Mark, Mel and I ate until we couldn't eat anymore, then sat there dazed for a bit, our stomachs not sure what to make of all the deliciousness. 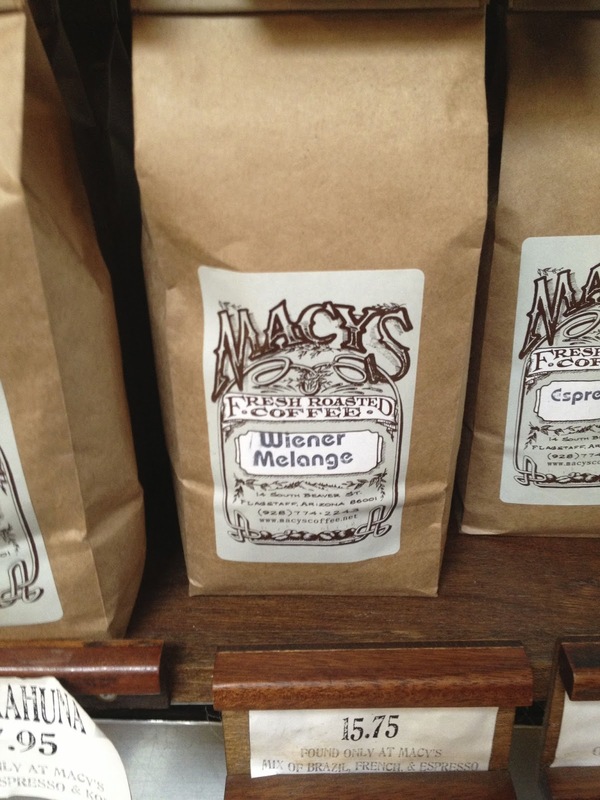 Macy's roasts their own coffee blends. This one had me stumped the first time through--I mis-read the label as "Wiener Massage." Their coffee is good, but that would be quite a promise. All good things must come to an end though and we had to say goodbye to Mel, with promises to get together again before another year goes by. 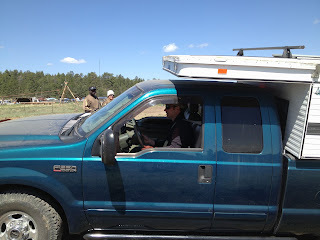 He was headed back to southern California and we rolled out of town toward the Four Corners area and Colorado. 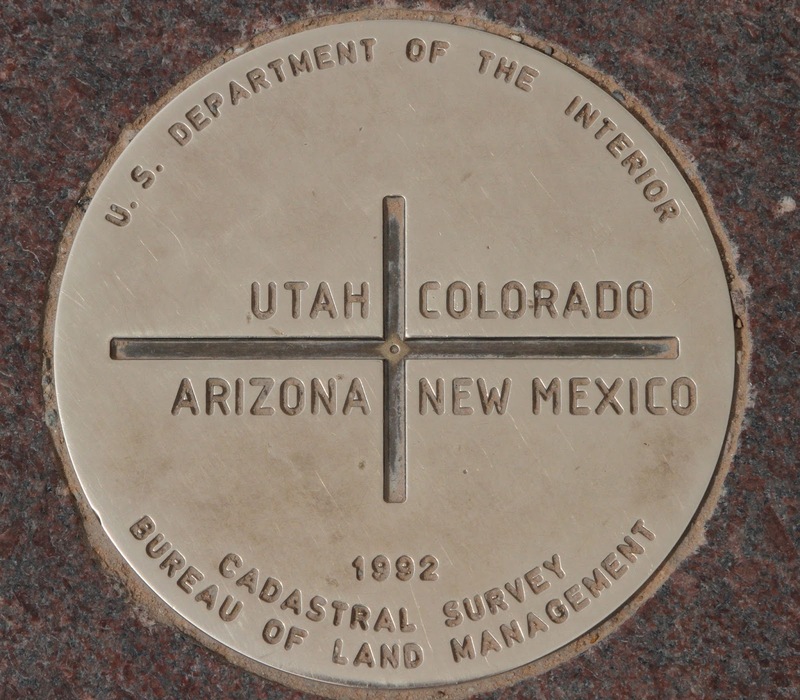 Four Corners Monument not only divides four US states, but also marks the boundary of the Navajo Nation and the Ute Mountain Ute Tribe reservation. 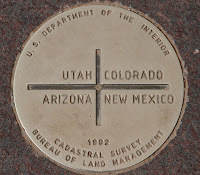 Although I understand that subsequent measurements have put the actual boundaries a little to the east, it's still pretty cool to stand in a place where four states come together, even if it's only in a symbolic way. We took the required shots of us standing in the spot, then turned our attention to the various vendors that surround the monument. It was close to 2 o'clock and our breakfast had long been digested. The monument is surrounded by four long rows of cement cubicles, and I assume the vendors rent space to sell their wares. One of the stands was offering Navajo fry bread tacos, and that sounded like a great idea. A young lady took our order and disappeared into the back, which was an area behind the cubicle partitioned off with tarps. She made the bread to order on a little camp stove, and piled it high with ground beef, lettuce, tomato and cheese. Very tasty, and not the least bit greasy. 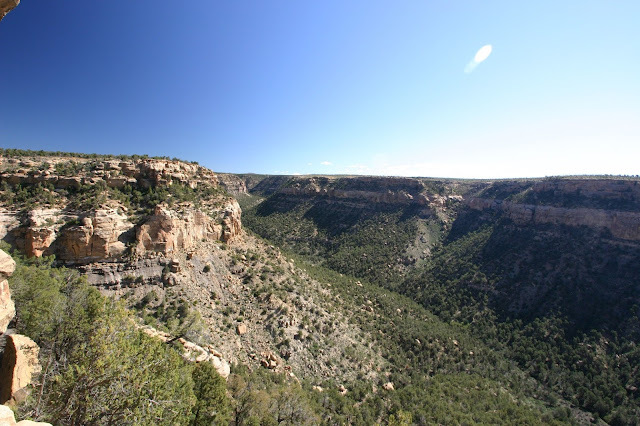 Had to get going if we were to reach Mesa Verde National Park in time to get a campsite, so off we went towards Cortez, Colorado. We were still being buffeted by the ever-present wind on the road, but up until this point it had been sunny. As we traveled north we could see the clouds were building and getting darker. We reached the park just five minutes before the visitor center closed. 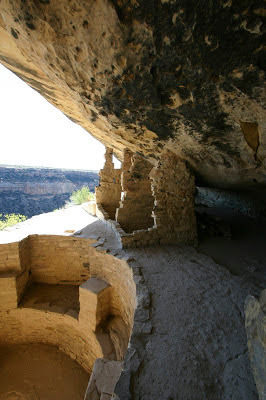 Since Mesa Verde is home to fragile archaeological sites, it's not the typical National Park--you can't just wander around at will poking around the cliffs--you have to sign up for tours to see most of the cliff house areas. Each guided tour costs $3.00 and they typically leave every hour. We squeaked in and signed up for the 9:00am tour the next day for Balcony House, then a 10:30am tour of Cliff House, all we'd have time for since we had to leave the park by noon the next day. 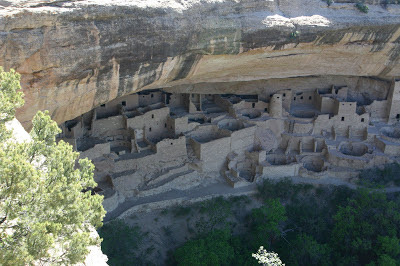 Mesa Verde is huge; the campground was 4 miles from the entrance, with the main attractions 17 miles beyond that. We were warned to allow an hour to get to Balcony House from the campground in order to make our tour appointment in the morning, and we had just lost another hour crossing into Mountain Time, so we thought it best to get to bed early that night. Found a spot in Morefield Campground, the only campground inside the park. May is actually early in the season in Mesa Verde, so about half the campground wasn't open yet. We had no trouble finding a nice spot among the oak trees that were just starting to leaf out. The clouds looked pretty ominous but it wasn't raining so we broke out the camp stove. Just as we started it up the first rain drops plinked down, then it started to pour. 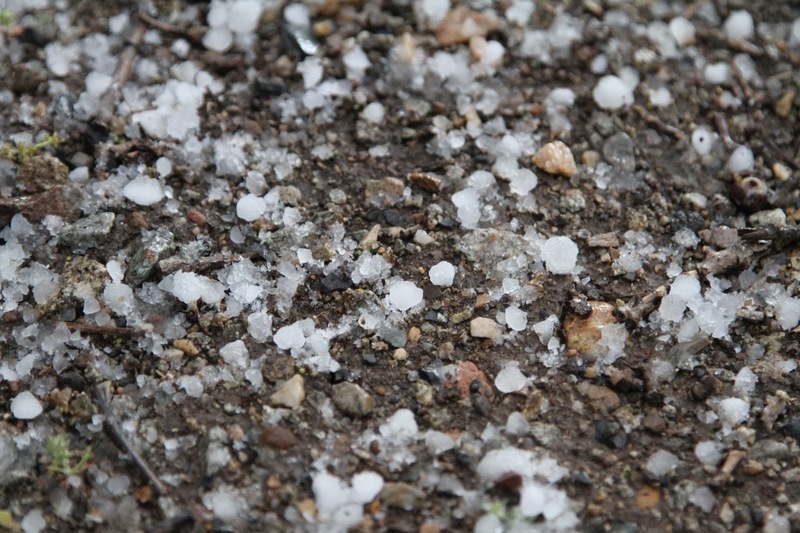 Then the hail started up. Then we decided we'd cook inside. In the morning we got up early, packed up and headed further into the park. Up and up the road wound around the mesa canyons and to the top. The clouds were gone and the views were stunning. 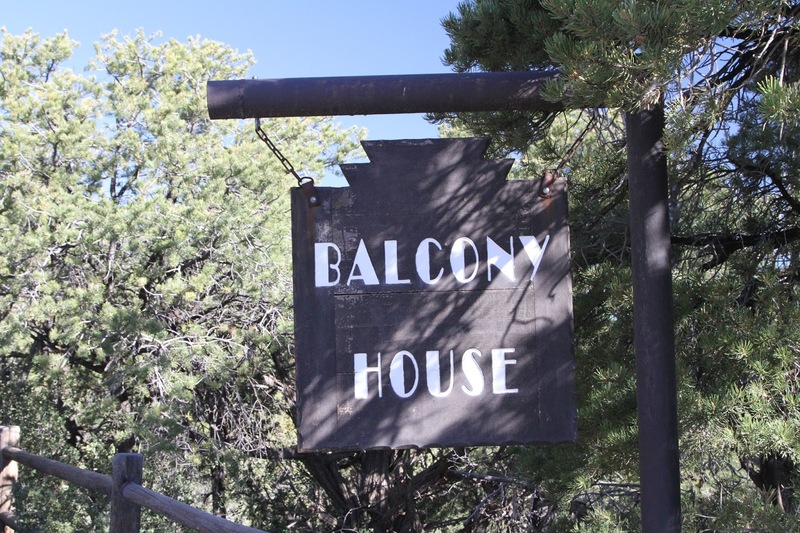 We made it to the entrance to Balcony House with a little time to spare and watched the ravens catching thermals in the canyons below. Our tour started with all the dire warnings about the steep cliffs, the tall ladders, the high altitude, etc. etc. Interestingly, we were told to leave all food items behind, and in fact the ranger made one guy spit out his gum. 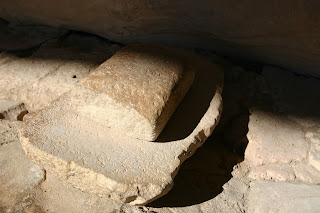 Any crumbs or sweet drinks that are spilled can attract rodents, that in turn start digging, undermining the walls; effectively ruining the ruins. Although he presented it in a humorous way, our guide was very serious about this. 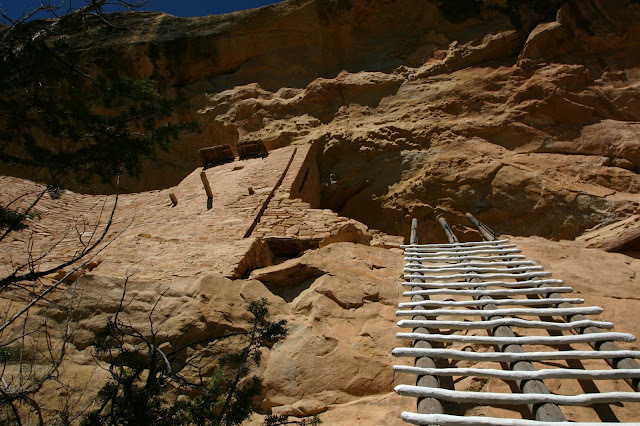 He had a vested interest in the park; he was not just a Park Ranger, he was a Navajo interpreter and his ancestors had most likely inhabited the very houses we were to visit. Ranger Clyde Benally gave the most outstanding tour we've ever taken in a national park (and we've taken many.) He began by making us look around and try to find what we could use to clothe and feed ourselves. He explained what was used to build the houses and how the Ancient Puebloans got to the cliff faces in the first place. 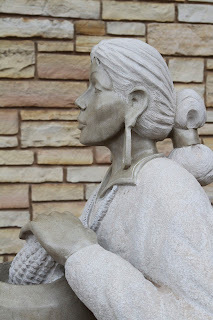 But the most incredible part of the tour was his explanation of the beliefs and spiritual elements of the people. He used the example of the Circle of Life--how the generations passed on stories and wisdom from one to another creating an unbroken chain leading through to this day. Toward the end he spoke to us in Navajo, which is a haunting language that sounds nothing like any other language I've ever heard. We had a couple of rangers-in-training along on the tour and all I could think afterwards was: boy, are you guys screwed. How could a regular Joe Ranger ever live up to that? To exit the ruins, we had to squeeze out through a very narrow tunnel then go up another ladder and a flight of stairs. I understood why the ranger who sold us the tickets looked us over before offering this tour; if you weren't in fairly good shape you'd never get out. 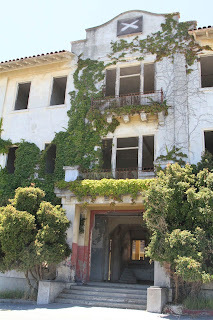 After that, the tour of the Cliff House was a bit of a letdown. It's much larger in scale, but it's also been picked over by generations of pottery hunters, "archaeologists" who tore the houses apart, took ancient artifacts and generally mucked up the ruins for future generations. It didn't help that on our first tour there had only been ten of us and this one was a tour bus mob of elderly folks mixed with families fresh from the lodge. Sanctity always suffers in a crowd it seems. Unfortunately, we had a lot of ground to cover if we were to make it to Great Sand Dunes National Park by evening, so after exploring the museum and gift shop for a bit, we had to leave. Yet another item on our list to visit again. We're really going to have to concentrate our efforts on winning the lottery so we can spend more time exploring all these wonderful places. After spending the first night of our trip in the Mojave desert, we were ready for our annual trek to the Overland Expo. 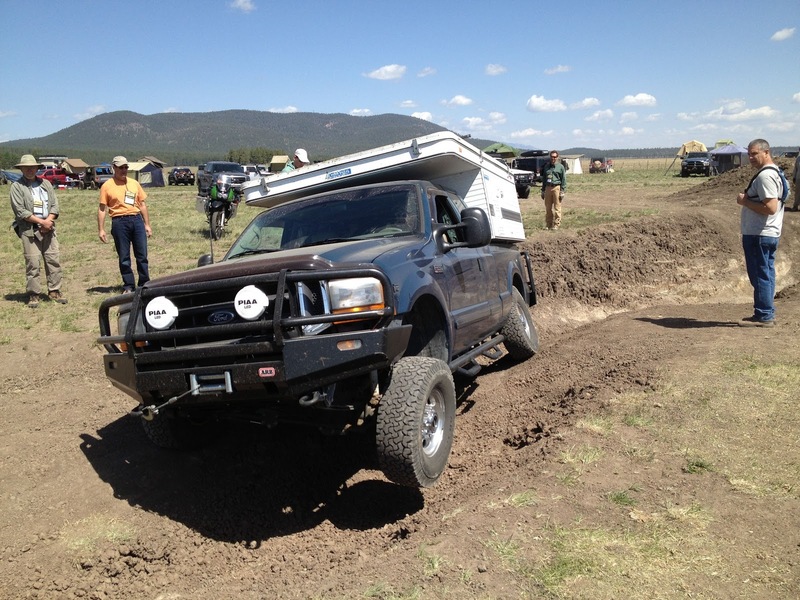 As it was in 2012, this year's Expo took place south of Flagstaff at Mormon Lake Lodge and campgrounds. Mormon Lake itself is actually mostly a field--an intermittent lake dependent on the amount of rainfall it receives during the year. The last few years have not brought much rain, and the "lake" is mostly deeply cracked earth and some tough grasses. When we arrived we found our friend Mel had already secured a nice spot in the campground for our little group, and he had joined forces with some other people he had met along the way. This, I think, is the best part of the Expo. 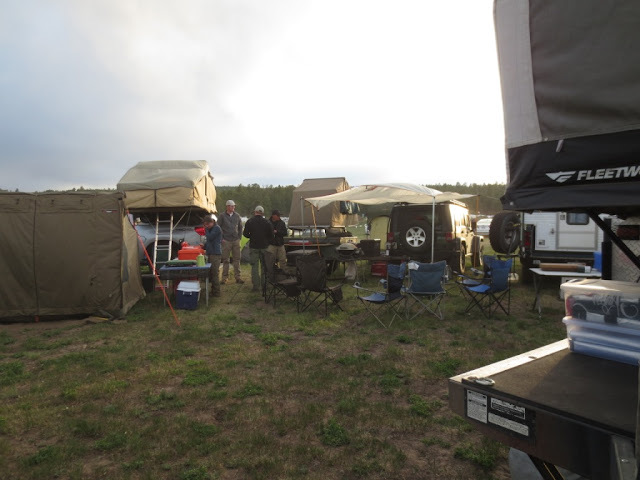 Every year we meet more and more people, gathering together the next year, comparing notes about where we've been, where we'd like to travel, and of course, what new equipment we've added to our "rigs". 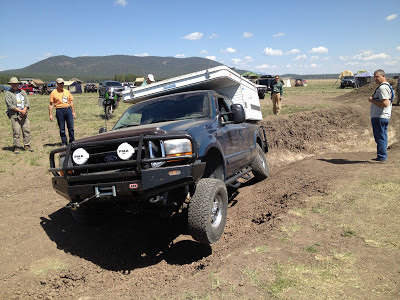 The Expo itself is a chance to learn more skills in off-road driving, map reading, cooking, and offer the vendors a chance to market their latest creations to us. Something to learn, something to buy, and a whole lot of people to share stories with: 6000 as a matter of fact. 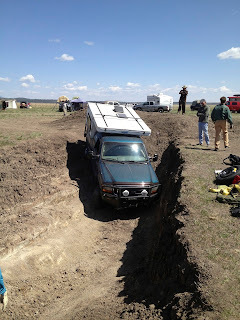 So our group consisted of our truck anchoring one end, two Jeeps and a truck with roof-top tents in the middle, a Suburban with a really nice ground tent, an all-terrain tent trailer, and later, a few backpackers that pitched a small tent on the grass finishing out our "circling of the wagons." 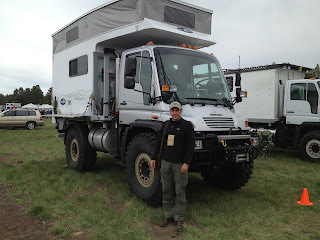 This is the beauty of overlanding: size really doesn't matter. You can travel in a rental car with a backpacking tent and have just as good (if not better) an experience as in a monster RV. After extensive study and beer consumption, decided to call ourselves "The Group"
Logo, official flag and business cards to follow. Friday morning Mark and I had our first class: Wilderness First Aid. We thought it was about time to face the fact we are no longer invincible, and if something happened 100 miles from a hospital and out of cell phone range perhaps we ought to brush up on our first aid skills. Our first lesson: if you have a heart attack, you're screwed. Yes, our incentive to cut back on the bacon was doubled by our instructor, who told us the chances of surviving a major heart attack beyond the reach of professional aid are pretty darn poor. You can learn CPR, keep perfect compression rhythm with the BeeGees "Sayin' Alive" and give mouth to mouth all day long, but if you have no means to get the heart started again, you're toast. So then the class moved on to what we might be able to fix. We learned tourniquet techniques, splinting, stopping blood flow and applying bandages. Clearing breathing obstructions, cleaning wounds, diagnosing head injuries, and over and over and over, stabilizing the neck and spine. This was a constant theme during the course, as it is one of the few injuries that if ignored, there's no do-over. Our instructor, Kristina Hall of Sweet Otter Training and Certification (http://www.sweetotter.com), drilled this into us by choosing "victims" and having the rest of the class stabilize and diagnose the injuries. It was a great way to hammer in our lessons and make it a bit more real. Plus it was a huge advantage to have your "patient" help you when you forgot a step. I can only hope the next injured hiker we come across will be so helpful. Instructor giving his reassuring talk. This is a picture of relief, if it can be captured in a photo. After that, the rest of the our classes were a piece of cake: driving through mud, cross-axle terrain, GPS and mapping skills. 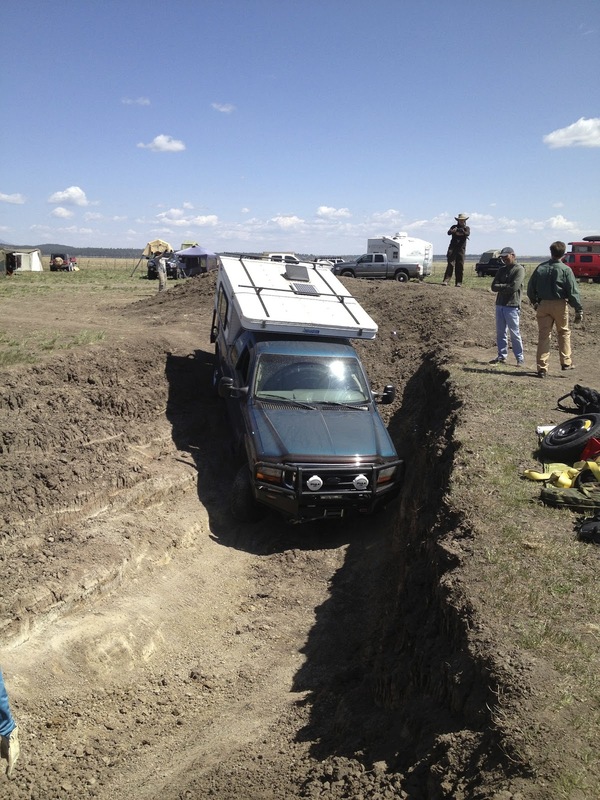 The truck was even called upon to do a few recoveries when a Jeep and a small truck got stuck on the course. Every once in a while it pays to have the biggest vehicle. 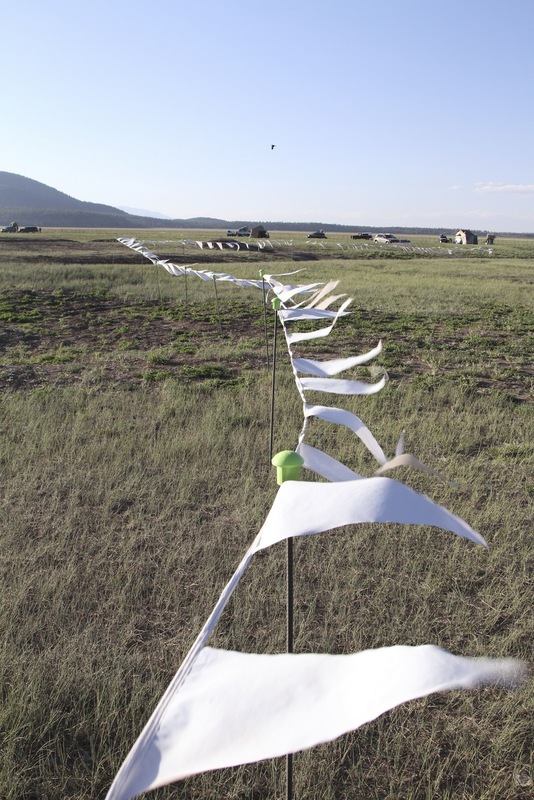 That night the wind was even stronger, if that was possible, so we decided to splurge and go out to dinner at the lodge, followed by a movie at the Overland Film Festival. Anything to stay out of the blowing dust for a while. Every night before bed we had to wipe our arms and legs down with a damp towel to keep the layer of dust from rubbing off in our sleeping bags. 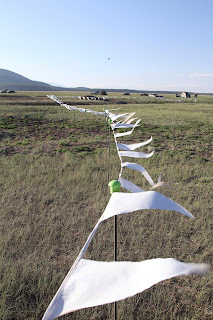 The ever-present wind blowing across the campground area. Sunday was a lazy day spent wandering around the vendor's stalls, chatting with everyone and checking out the assortment of camping vehicles. The array of equipment is pretty staggering: everything from bicycles to motorcycles to gigantic Unimogs were on display. It's funny though, the more we looked, the happier we were with our set up. This was reinforced by the fact that our rig is paid off and what we might spend on a new one could be used for our next big adventure. 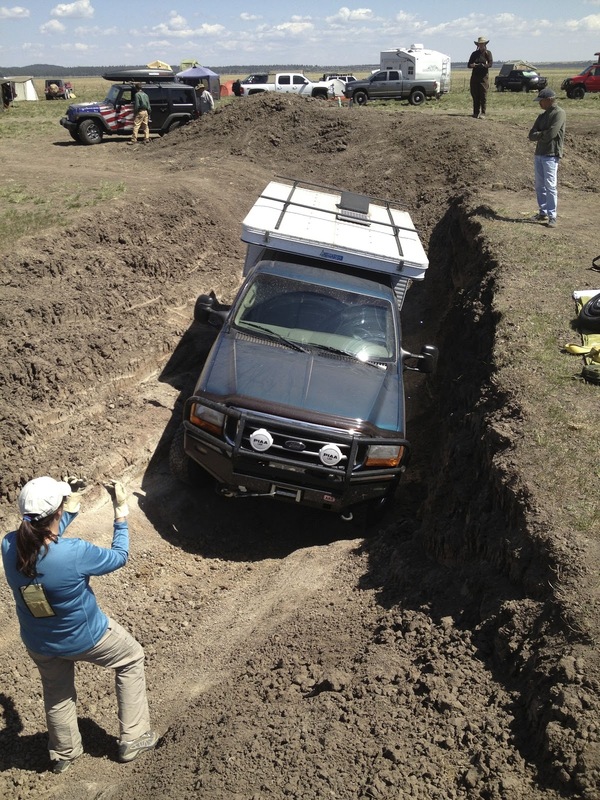 And on that note, we researched an outfitter that sets people up with Land Rovers in Africa for a self-driven safari. Next year perhaps? and a bit bigger than we're willing to go.